The 1833 Capped Head Half Eagle survivorship is very low and is popular with collectors. Throughout the early decades of the 19th century, US gold coins contained more bullion value in European markets than their face value on the home front. Bullion speculators seized upon this opportunity by shipping US gold overseas, where it was melted down and traded at a rate of 16 ounces of silver to one ounce of gold. The silver was sent to the United States (where the silver-gold ratio was set at 15:1 by law) to buy more gold coins and restart the cycle. The Mint Act of 1834 reduced the amount of gold in US gold coinage, effectively putting a stop to this mass exportation abuse. The Capped Head Half Eagle of 1813-1834 suffered great melting losses. Despite fairly healthy mintage numbers, all Capped Head Half Eagles are very rare and motivate coin collectors to the extreme. Consider the 1833 (both large and small date). A total of 193,630 pieces were struck, but no more than 75 survive to this day. True scarcity, combined with collector popularity has pushed the 1833 Capped Head Half Eagle off the value increase chart (see below). The 1833 Large Date Capped Head Half Eagle has one of the most impressive records of price increases in US numismatics. The blue line above graphs the percent value increase of the 1833 since Jan 2000 in F-12 condition. The red line charts progress over the same time period of the Rare Coin Values Index. The Index is comprised of a pre-selected group of 87 rare US coins, the purpose of which is to understand the strength and direction of the overall rare US coin market. 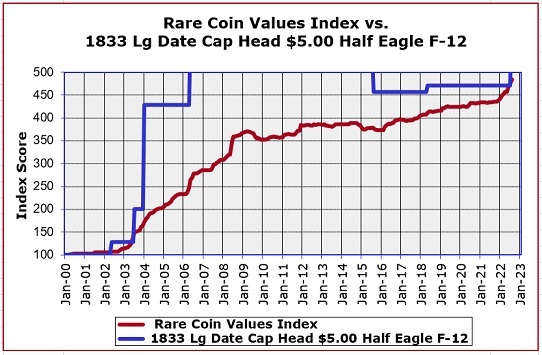 The 1833 Half Eagle is one of the 87 coins in the Rare Coin Values Index. All Index charts are updated monthly.